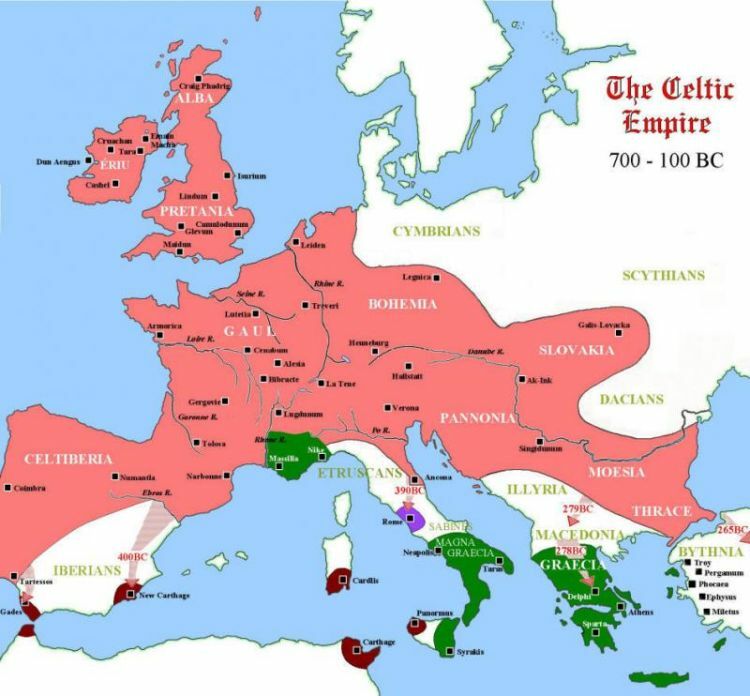 The Romans invaded Britain at least a century before the birth of Christ and pushed the Celts to the fringes of the Empire, into what is today Ireland, Wales, and Scotland. Celtic culture flourished there during the centuries the Romans were in Britain. The Roman army withdrew from Britain in the fifth century, as it was needed to protect the heartland of the empire in Europe. Christianity most likely came to the British Isles within a hundred years after the resurrection of Jesus. When the Angles, Saxons, and Jutes invaded Britain midway through the first millennium, they destroyed most of Britain’s Roman culture along with the organization of the early British church. Before its decline, however, early British Christianity had reached the pagan Celts in Wales, Scotland, and Ireland. We can trace a Christian witness among the Celts to the early fourth century. While the flame of Christian faith and culture was nearly extinguished in Britain and much of the rest of Europe, it burned brightly in Ireland, and nobody is more responsible for fanning that flame than the man we know today as Saint Patrick. Patrick was born into a Christian home near the northern frontier of Roman Britain. When he was fifteen, he was captured by slave traders from across the Irish Sea who took him to Ireland, where he was sold into the service of an Irish landowner. For at least seven years Patrick herded sheep on an Irish hillside until, in a vision, he received a message from God that he would be given protection, provision, and safe passage back to Britain. He escaped from his Irish slavemaster, God did protect him on his return to Britain, and after preparing for the Christian priesthood in a monastery in France, he returned to Ireland, as a bishop and missionary, to preach the gospel to the very people among whom he had been a slave. For a century and a half Ireland was isolated from the chaos of the collapsing Roman empire. During those years it became the center—and the preserver—of much of European Christian culture. Thomas Cahill tells this story brilliantly in his book, How the Irish Saved Civilization. The title exaggerates the facts a little, but not a lot. Patrick and those who followed him established monasteries, primitive communities of monks and nuns. In the rural Celtic world, monasteries were the only institutions with the resources to serve as repositories for Christian manuscripts and beautiful illustrated texts of scripture, such as the Book of Kells and the Lindisfarne Gospels. Unlike monasteries of a later era, where cloistered monks could cultivate relationship with God in relative isolation, Celtic monasteries were centers for preparing and equipping believers to spread the gospel. Christian Ireland was a missionary church. Columbanus (d. 615) evangelized Europe as far as Austria, Switzerland, and Northern Italy, making converts and establishing monasteries wherever he went. Also in the 6th century, Columba (or Colum Cille), under self-imposed exile from Ireland, established a monastic community on the tiny island of Iona, just off the west coast of Scotland. Iona became a major center for the re-evangelization of England and northern Europe. In 597, with the worst of the chaos in Europe now over, Pope Gregory sent a man named Augustine (not the great theologian from North Africa who lived a century earlier) to Britain. Augustine made new converts in southern England where primitive Christianity had flourished some three centuries before. As Christianity of the Roman variety spread throughout England, the influence of Celtic Christianity declined. Celtic Christianity was less orderly than the Roman variety, and the Celtic church, apparently without much resistance, formally accepted the authority of the larger Roman Catholic world at the Synod of Whitby in 664. Thereafter, Christianity in Britain and Ireland became increasingly unified as part of Roman Catholicism. The intense interest today in Celtic spirituality (among Christians) is based on the belief that, in those centuries of relative isolation from Europe, Celtic Christians developed a culture that was, in many respects, closer to the early church, and to “true Christianity,” than any of the forms of institutionalized Christianity that replaced it. I don’t know if that is true. For one thing, we have very few manuscripts recording the history of Celtic Christianity which were actually written in that time period. Most were written some centuries later and were no doubt embellished as the story was passed along from generation to generation. We are fortunate to have a document, written by St. Patrick, which gives some insight into early Celtic Christian faith. Called his Confession, it is a personal testimony which makes it clear that Patrick not only embraced essential Christian orthodoxy but also exhibited a profound humility which arose from his intense faith. Celtic Christians left us some wonderful poetry celebrating the world as God’s creation, but there is nothing uniquely Celtic about a recognition of God’s presence in nature. What is unique about Celtic Christianity is that the conversion of the Celts is the only example in church history in which a pagan culture was completely transformed by the gospel without, at the same time, being influenced by the culture which brought the message. Further, the penetration of Celtic culture with the message of the gospel involved absolutely no violence or coercion of any kind. Much of my interest in Celtic culture is purely personal. My roots, on my mother’s side of the family, are in Ireland. Her father was the stereotypical Irishman—red haired, short-tempered, hard-drinking, with a flair for spinning tales—whose parents came from County Clare in western Ireland. But my interest in Celtic Christianity is far more than merely genealogical. I find in Celtic Christianity a basic, practical, stripped-down faith without pomp and pageantry but with enough ceremony and simple elegance to touch all my senses. I’m tired of Christianity which encourages hypocrisy, where I only fit in when I conform to somebody else’s pre-determined pattern for acceptable Christian living. I’m tired of preaching radical discipleship among Christians who are more concerned with net worth and retirement plans than with spiritual poverty and kingdom values. And I’m tired of fighting over doctrinal differences and splitting hairs over theological technicalities. highlights a rich worship tradition; fosters prayer in everyday language; is “green” in its stewardship of the earth; affirms women and men equally; is committed to living in community; nurtures radical discipleship; is passionate about peace and justice; has no divide between sacred and secular; engages critically with contemporary culture; is rooted in mission, not maintenance. That list addresses many of the inadequacies and imbalances in contemporary evangelical Christianity. It is a worthy goal, toward which any local church or denomination should want to move. And I’m convinced that the proliferation of churches with emphases like these could not help but have a positive effect on 21st century Christianity. I conclude this post with reference to a traditional Celtic hymn which illustrates the richness of that tradition and why it continues to have value for contemporary Christians. The hymn is sometimes called “St. Patrick’s Breastplate,” although most hymnologists doubt that Patrick actually wrote the text. It was probably written in the 8th century, but it preserves the heart and spirit of Celtic faith. I am including two renditions of this hymn along with this post. The first is a spoken version, backed by instrumental accompaniment. The second is a choral arrangement. To listen to one or both versions, click the appropriate button below. To purchase version one as an mp3 download from Amazon, click here. To purchase version two, click here. And have a Blessed and Happy St. Patrick’s Day! This entry was posted in Christianity, contemporary culture, discipleship, Evangelicalism, Gospel, mission and evangelism, spiritual formation and tagged Celtic Christianity, Christianity, contemporary culture, discipleship, gospel of the Kingdom, radical discipleship, spiritual formation, St. Patrick by Eric Kouns. Bookmark the permalink.